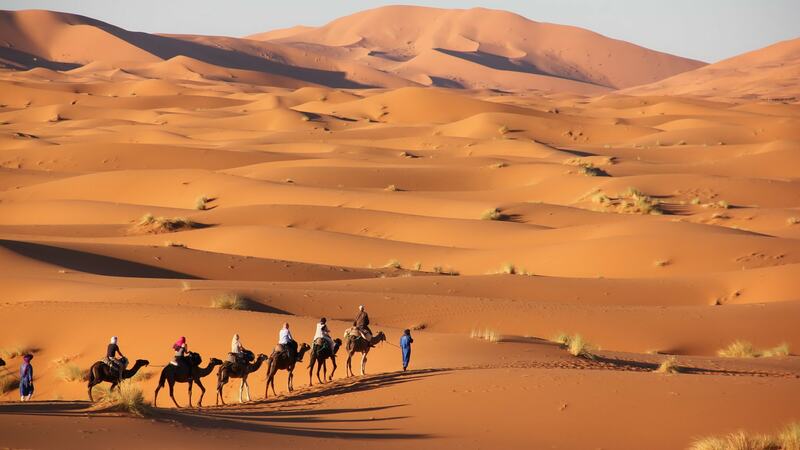 This 4 days 3 nights desert Tour from Marrakech will give you an oportunity to discover the real Morocco. The beauty of the dunes stretching out into infinity Follow the path of the camel desert caravan. Explore the southern side of Morocco Ouarzazate, Ait Benhadou, Rose valley, Dades Gorge, Todra Gorge Draa and the High Atlas mountains with its Berber villages..
You will see Kasbahs, golden sand dunes, oases, distant mountain summits, the Valley of a Thousand Kasbahs, the ‘Moroccan Hollywood’ and sunrises and sunsets so beautiful you will never forget them. You will also spend your time riding camels which are the natural choice for riding through the arid beauty of the Moroccan desert. If you don’t have enough time for this 4 day Sahara Desert tour then we can offer you the choice of a 2 Day Sahara Desert tour to Zagora or a 3 day Sahara Desert tour to Merzouga. Whichever tour you choose you will be accompanied by a guide and driver who will make sure that all your needs are met and provide you with information on all of the different places you will visit. 9.00 AM pick up from your accommodation and a drive to the Atlas Mountains, over stunning Tizi-n-Tichka pass. You’ll pass through lots of Berber villages, and once you’re in the desert, you’ll see riverside oases and barren hillsides dotted with kasbahs (fortified dwellings that house families and their livestock). You will have the option either to take a break and visit the Ouarzazate Film Studios or stop for a hike. Once you reach Dades Gorge, you have the option of going for a hike, or relaxing at your hotel. Overnight in Dades. 6 to 7 hours drive. Breakfast at the hotel. Transfer from the Dades Valley to Todra Gorge - a massive fault dividing the High Atlas mountains, rising up 300 meters in a narrow valley with palmeries and Berber villages. Here, you can go for a hike to explore the palmery, a green oasis full of large date palms. After lunch you’ll head further into the desert to the gateway town of Merzouga to pick up supplies for your desert trip. You will then drive on to a kasbah to pick up your camel. At sunset, you’ll trek for an hour-and-a-half by camel to a Berber camp where you will enjoy a traditional Moroccan dinner, and sleep under the stars or in tents at a desert camp. 4 to 5 hours drive. Wake to a desert sunrise and then return to the kasbah by camel. You will then have a chance to freshen up and enjoy a breakfast. Once you are refreshed, you will head out of the desert for a drive to Ait Benhaddou. This is an ancient fortified city containing countless kasbahs and has been the atmospheric subject of numerous Hollywood movies (The Mummy, Gladiator, Alexander, Lawrence of Arabia...) You will have the chance to walk around the buildings and explore with your guide. You will overnight in a hotel close to Ait Benhaddou. 5 to 6 hours drive. Travel along the Ounilla Valley to the Telouet Kasbah, a crumbling kasbah that was once an important stop for traders. Explore the Kasbah and then after lunch, you will head back over the Tizi-n-Tichka Pass to Marrakech. 3 to 4 hours drive.